The Kamiq has Skoda's SUV styling with vertical double slats in its grille. 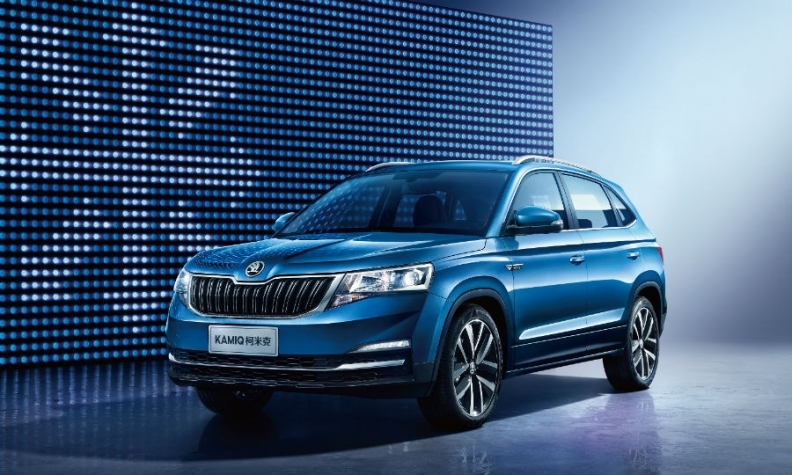 Skoda aims to capture a larger share of China's booming SUV market with its new Kamiq aimed at buyers in cities. The automaker is unveiling the Kamiq, developed specifically for China, at the Beijing auto show this week. Skoda CEO Bernhard Maier said the SUV segment in China is undergoing "dynamic" growth, with demand doubling in the past three years. The Kamiq will help Skoda nearly double its annual vehicle sales in China to 600,000 by 2020 from 325,000 last year, he said in a statement. The Kamiq replaces the Yeti in China and joins the compact Karoq and midsize Kodiaq in Skoda's Chinese lineup. A sportier Kodiaq GT will be added later this year while a fifth SUV, codenamed Project K, will be unveiled next year. Skoda described the Kamiq as "surprisingly spacious." At 4,390mm, it is 168mm longer than the Yeti. Its width is nearly identical at 1,781mm but the Kamiq is 100mm shorter at 1,593mm. Skoda said it has loaded the Kamiq with connectivity features to attract "young, urban customers "who wish to maintain their digital lifestyle" while they are in the vehicle. It has an 8-inch touchscreen infotainment system that runs China's iFlytek voice recognition software as well as Apple CarPlay and Baidu Carlife to sync with mobile phone systems. Power comes from a 1.5-liter gasoline engine making 109 hp, mated to an automatic transmission. The SUV is built on a version of Skoda's low-cost PQ platform rather than parent Volkswagen Group's MQB architecture to better compete against budget Chinese rivals. Skoda is also working on a small SUV for European markets based on MQB scheduled for launch early 2019. The car was previewed by the Vision X concept unveiled at the Geneva auto show in March.